A young Anthony, studying the Word of God, looks into the night, startled by an apparition of his Lord. Was it a vision, a dream, or a product of his imagination? He does not know, but it does not matter. For Anthony, all that matters is that the event awakens him to the reality of the Lord’s abiding presence in his life: “Faith is the assurance of things hoped for, the conviction of things not seen” (Hebrews 11:1). Some sources tell us the experience was so vivid he thought he felt the Christ-child brush His hand against his cheek. 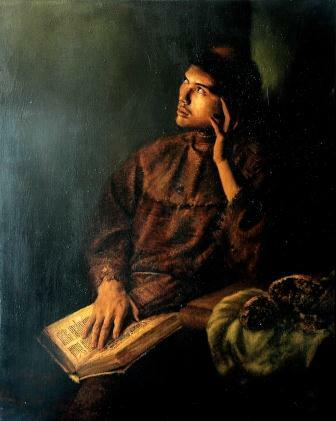 In this original painting, the saint is portrayed as a youth, gazing towards a source of light and a holy presence, recognised by him but unseen by the viewer. A shadow of a finger on his left cheek suggests the physical sensation of the Lord’s gentle touch. The half-eaten loaf of bread on the side table next to the illuminated Holy Scriptures calls to mind the Old Testament quote which Jesus himself referred to: “He humbled you and let you be hungry … that He might make you understand that man does not live by bread alone, but man lives by everything that proceeds out of the mouth of the Lord” (Deuteronomy 8:3). The broken loaf of bread, calling to mind the Bread of Life, sits on a shroud-like cloth embroidered with lilies, a symbol of St Anthony. An army of ants swarm towards the bread. While these would elicit disgust in most, and many would try to destroy them, Anthony is unperturbed. Francis of Assisi, who Anthony knew personally and whose Order Anthony joined, has showed that all creation and every creature is holy, and loved by God. After all, the Lord Himself gave His Life for all, for saints and sinners alike, and has called us to live as true children of the Heavenly Father, who “causes His sun to rise on the evil and the good, and sends rain on the righteous and the unrighteous” (Matthew 5:45).